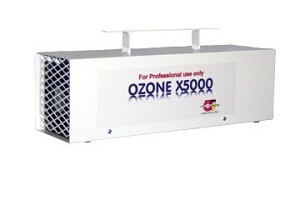 Ozone… The new CTI “OZONE-5000” reaches new highs in Ozone production with outputs to X5000 mg. / hr. This is a machine built for performance, simplicity, and reliability. The new OZONE X5000 not only leads the industry in Ozone production but also excels in high volume throughput with dual high pressure fans to drive the Ozone Gas. Once you plug this machine in… get out and close the door because it is immediately pumping out an amazing concentration of Ozone with high volume air flow to assure distribution of the gas.